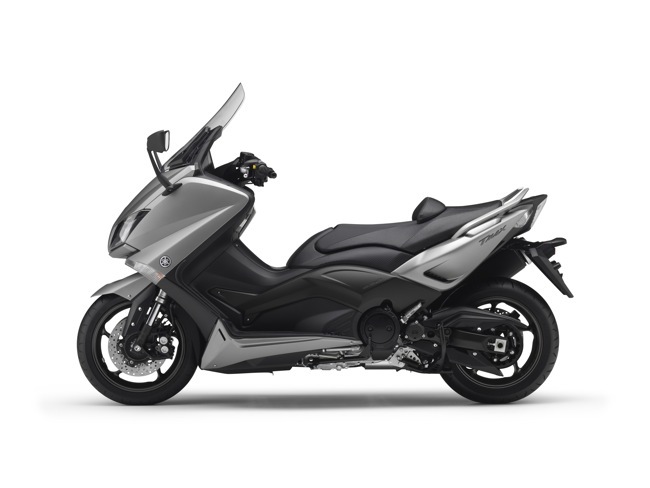 The Yamaha TMAX update for 2015 is here. This includes the limited Iron MAX edition. 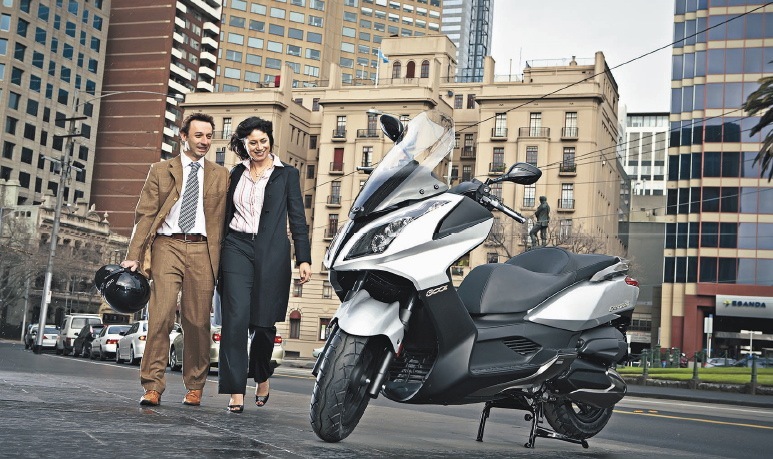 With its motorcycle performance and scooter comfort and convenience, this innovative and ground breaking model was responsible for the creation of a whole new sector in the two- wheeled marketplace. 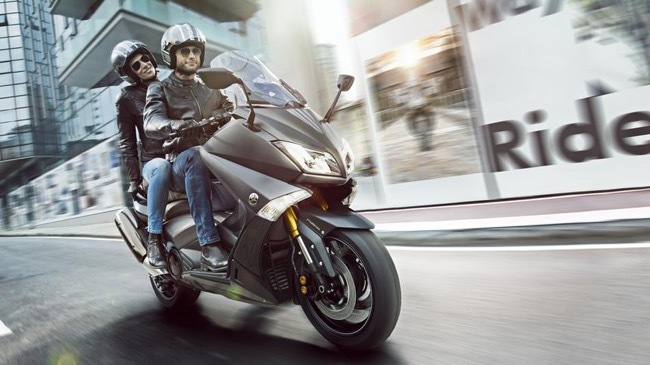 Yamaha's research has shown that the TMAX inspires a high level of loyalty amongst its many thousands of owners, and each year a significant proportion of new sales are made to customers who are trading up from an older model TMAX. This unprecedented level of customer loyalty reflects the timeless and ongoing appeal of this model, and it reinforces Yamaha's engineers' commitment to ensuring that the needs and desires of our customers are the key target when any technical or stylistic change are introduced. 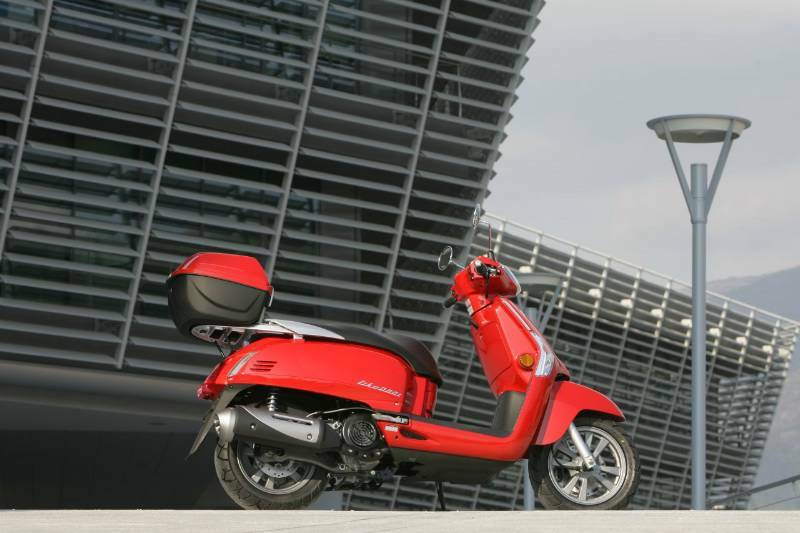 For 2015 YMA has revealed a new TMAX as well as the special version of this maxi scooter: Iron Max. Building on the enviable reputation of their top- selling predecessors, these latest models share the same advanced engine and chassis specification and benefit from the same improvements for 2015, with the main differences being stylistic changes. Every change to the design and specification of this best selling model is made with the tastes and needs of our sophisticated and well informed customers in mind. Research shows that many scooter riders prefer to ride with an anti-lock braking system. TMAX braking excellence is ensured with supersport spec radial mount calipers, twin front discs and now ABS on both front and rear brakes to help prevent wheel lock up in slippery conditions. 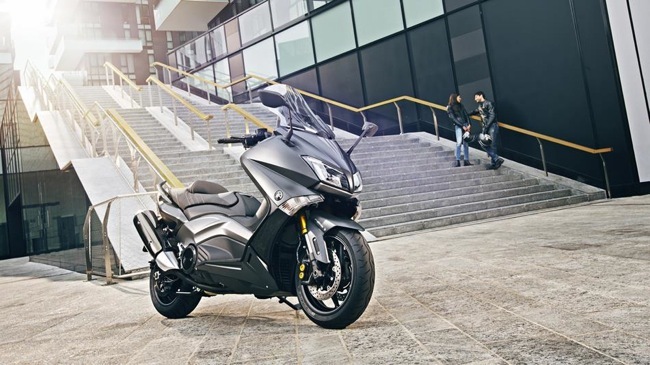 For 2015 the latest TMAX's new-look face is equipped with angular new LED dual headlights, and the refreshed front-end design also features a central diffuser that replaces the previous model's position light. Located below the screen, this delta-shaped diffuser is designed to smooth out the airflow across the cowl and screen for better wind protection. 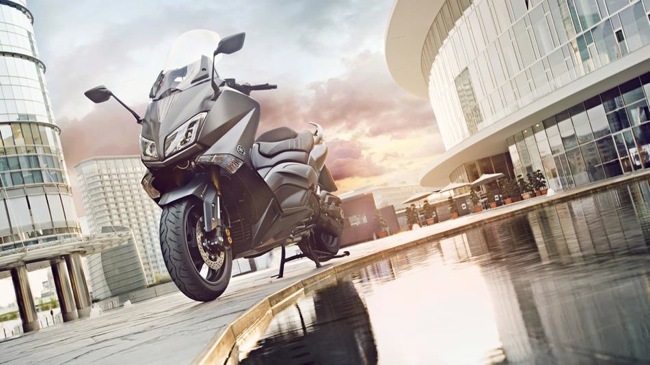 For the first time in its illustrious 14-year history, the TMAX is equipped with full LED headlights that offer the multiple advantages of being light, powerful and energy efficient. The new LED dual headlights are located slightly higher in the redesigned cowl for 2015, and this gives a lighter and more compact look. Another new feature is that the both of the LED headlights are always on - whether the switch is set to low beam or high beam mode - and this feature reinforces the scooter's charismatic and distinctive ‚Äòtwo-eyed‚Äô impression all the time. The TMAX's iconic look is accentuated by the adoption of dual LED position lights that shine through boomerang-shaped lenses, giving this class-leading sport scooter enormous visibility on the street, in the day or at night-time. 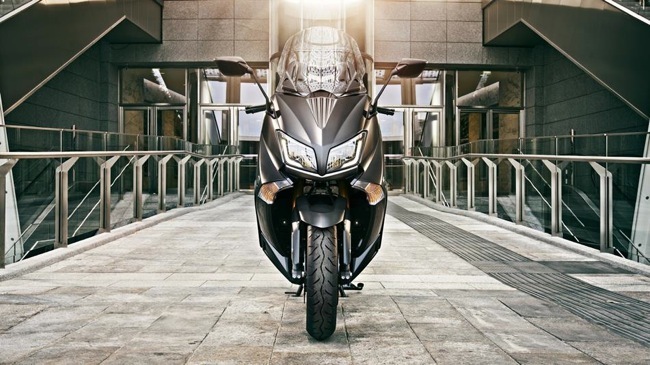 The TMAX is justifiably famous for its motorcycle-style riding feeling, and the adoption of new upside down front forks for the 2015 model year is sure to further improve its reputation for unique and sporty handling performance. The new forks are equipped with strong and light 41mm diameter inner tubes, and as well as ensuring a precise steering feel and excellent high speed handling characteristics, this new front end reduces unsprung weight to give plush and responsive suspension characteristics for a more comfortable ride. Complementing the new upside down front forks is a redesigned front mudguard that gives the 2015 model a more refined and sporty image. With a wide, downward slanting front section and deep, angular sides, the mudguard protects the new forks and enhances the aerodynamics. Radial mount front brake calipers were originally developed for our supersport motorcycle range, and the latest TMAX is the first Yamaha scooter to be equipped with this high-performance system. A special feature of the new caliper design is that the mounting bolts are positioned facing forwards - rather than at 90 degrees to the discs - to give excellent rigidity balance and improved feel. The newly designed 4-pot opposed piston calipers are coupled with dual 267mm diameter floating discs that offer strong and effective braking performance. The new TMAX is fitted with a sophisticated and sporty instrument panel that features twin circular analogue dials for the speedometer and tachometer, with precision look needles and numbers on black backgrounds - and for enhanced style and clarity the backlighting colour changes to red for the new model. 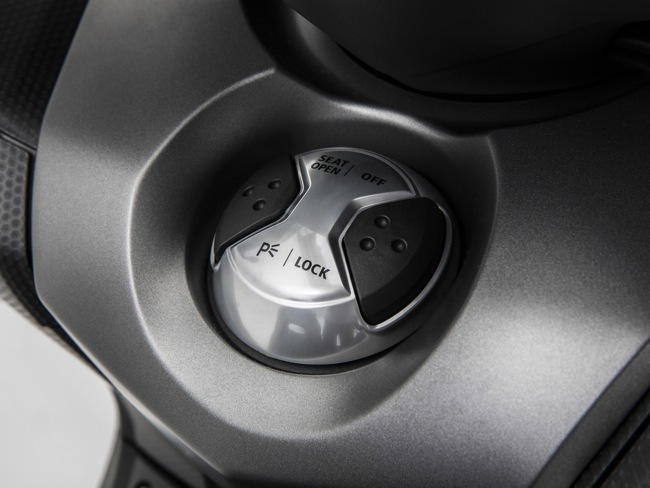 For added convenience the 2015 TMAX adopts a new Smartkey system. All the time that the rider is carrying the new key fob on their person they will be able to start the scooter simply by pressing a button. The new Smartkey system is also designed to control the remote engine immobilising functions including the steering lock and the seat opening, while the front storage lock and fuel cap lock require physical key insertion. Featuring a high quality metallic chrome finish with an engraved tuning fork logo, the new Smartkey highlights the sophisticated design of the renewed TMAX, and makes for easier and simpler operation. Another feature that gives improved functionality is the new 12V outlet, enabling the rider to plug in a number of devices for personal use. The sophisticated and sporty instrument panel features twin circular analogue dials for the speedometer and tachometer, with precision look needles and numbers on black backgrounds - and for enhanced style and clarity the backlighting colour changes to white. Suzuki launch new look website showcasing the Australian Scooter, Motorcycle and ATV range. 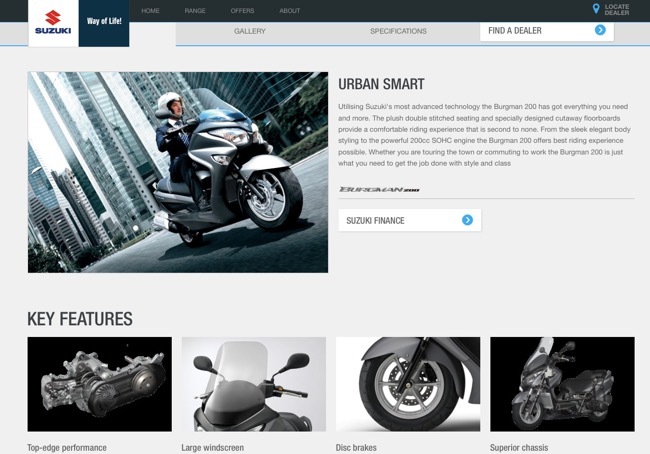 Suzuki has launched a new look website that focuses mainly on targeting user friendliness. The site now caters for all browser types and has been filled with all the latest news and media. The site also features the new Address, a scooter that will be released here in Australia shortly. See the official press blurb below. Suzuki Motorcycles Australia is inviting the motorcycling public to explore the all-new suzukimotorcycles.com.au website. The website has been completely redesigned to provide the ultimate user-friendly experience with improved navigation and functionality throughout. Customers can access detailed product information, images and videos with the option to share information across all major social networking sites. 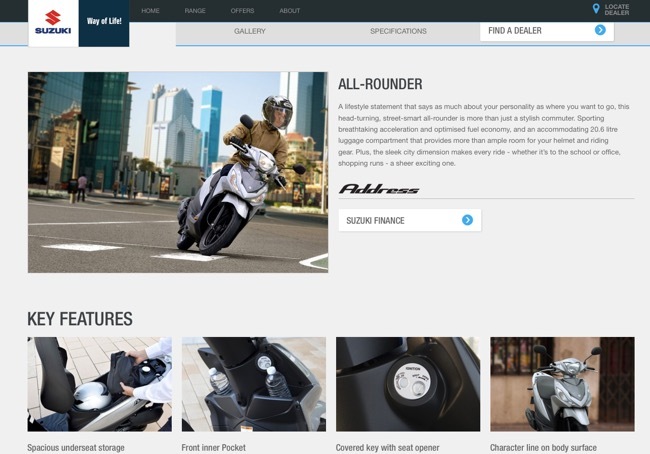 The new site includes extensive product information to help customers understand the complete range of Suzuki Motorcycles, ATVs and Scooters. This information is now even easier to navigate with the new browse function which allows customers to filter the product range in terms of engine capacity, price range, model categories and learner-approved status. The compare function, allows the user to compare the full specifications of up to 3 models simultaneously. Created with the ultimate user experience firmly in mind, the website has been designed using the latest technology and compatibility with today's browsers and mobile devices. Customers can now benefit from richer online content that is easier to navigate and share with others, assisting in the purchasing process. This is a direct result of talking with our customers and gaining valuable feedback. 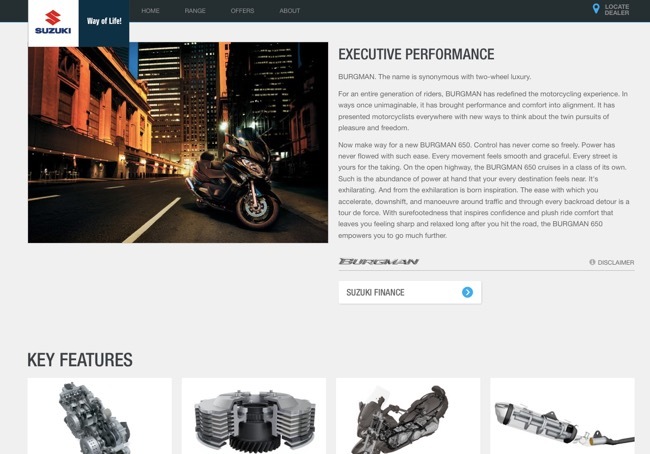 On suzukimotorcycles.com.au, visitors will also be able to stay informed with the latest Suzuki news such as model announcements, special offers, racing results and upcoming events. Kymco are pleased to announce the introduction of a standard 3 Year unlimited kilometre warranty on their entire scooter range. Kymco are proud to announce they are now offering an extended 3 year warranty across their entire scooter range purchased from February 1st 2015 at no extra cost. The warranty covers both parts and labour and is not restricted by kilometres travelled. 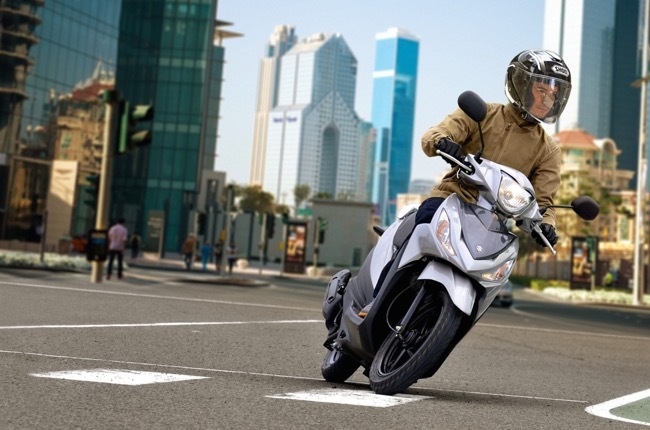 Kymco rightly want you to get out and riding as much as possible. Whether you are looking for a smaller capacity scooter for zipping down to shops, gym or beach or looking for a larger commuter or tourer, Kymco has you covered with quality built scooters with world class features at competitive prices to meet all needs and budgets. Now with a 3 year warranty it is just one other reason to get yourself down to an authorised Kymco dealer and purchase a new Kymco scooter with confidence.